Arthritis is a chronic condition caused by inflammation in the joints. There are more than one hundred arthritis types that can occur at virtually any joint in the body, including the toes. The symptoms of arthritis in toes generally develop over time and are most common in adults of advanced age. Toe arthritis, as you might imagine, is inflammation of the toe joints. It’s most common in the big toe, but can be present in any toe. A past injury, such as a break or sprain, can increase the risk. 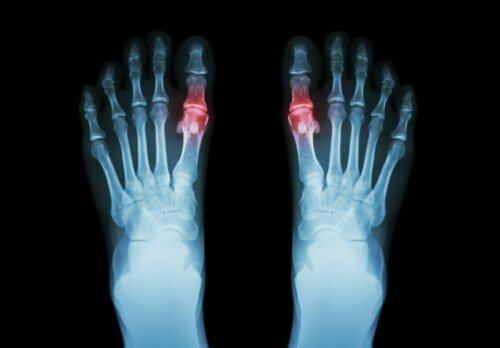 What Increases the Risk of Developing Arthritis in the Toe? Do you have arthritis in your toes? It’s possible if you’re experiencing classic symptoms like joint pain and stiffness. However, pain in the toes can also be attributed to gout. Stiffness: Over time, arthritis wears away at the cartilage between the joints, damages synovial fluid, and inflames tissues. These changes can make your joints stiff and hard to move. With less support, joints become more resistant to bending. This makes it difficult to walk, especially because the toes help with balance and lifting the foot off the ground. Swelling: If you have trouble putting on your shoes due to swollen, inflamed feet and toes, it could be a sign they are arthritic. Pain: Pain is a common symptom of toe arthritis. You may feel pain in all of the toes or just the big toe. Depending on the severity of the inflammation, it can range from a strong ache to a sharp, stabbing sensation. Change in appearance: If your toes begin to look different (i.e. larger than normal or they rotate in another direction) it could be a sign of toe arthritis. Once the cartilage wears away and the bones grind against each other, the body attempts to resolve the situation by creating more bone. Your toes may even take on the appearance of claws. Clicking and popping: As the cartilage that cushions the bones in a joint wear away, the bones will rub against each other, resulting in a grinding or popping sound. Locked joint: A locked joint occurs when there is so much swelling and stiffness that the joint becomes “locked” and can’t bend anymore. You might feel as if your toe is stuck, but not to worry; in most cases it’s not a permanent condition. Heat: When inflammation brings more blood to the toes, they may feel warm, heated, or tender to touch. Formation of a bump: Rheumatoid arthritis can increase your susceptibility to bunions, which are bumps that can form along the base of the big toe. Bunions can increase the size of your big toe and may cause redness. A callus can also cause a bump on the toe, as can a reaction to the joints rubbing together. Everything from past injuries (i.e. a broken or sprained toe), osteoarthritis, gout, or rheumatoid arthritis can lead to toe arthritis. Common forms of toe arthritis are rheumatoid arthritis and osteoarthritis. Let’s more closely examine these and other damaging types. Rheumatoid arthritis (RA) is often hereditary and can affect the entire body. This type of arthritis causes the foot arches to collapse and result in stiffness and swelling in the foot. As a result, the toes are generally forced into an uncomfortable, constricted position. It’s the most common type of inflammatory arthritis and people who have it will often notice symptoms in the feet and toes. Osteoarthritis (OA) can affect any of the joints in the foot, but it commonly causes arthritis in the big toe at the metatarsophalangeal, or MTP joint. The MTP joint is located at the bottom of the big toe. Toe arthritis can lead to the erosion of cartilage and cause stiffness and pain in the toe. When OA occurs in toes, it’s usually referred to as hallux rigidus. Psoriatic arthritis: Psoriasis is an autoimmune disease that affects the skin. In some cases, it can move to the joints where it can affect the toes. Sometimes, psoriasis affects the joints before it spreads to the skin, but that is rather uncommon. If you believe you have psoriatic arthritis, early diagnosis is very important in stopping potential joint damage. Infectious arthritis: Arthritis can also arise from an infection in the joint and is usually caused by bacteria in the bloodstream. Small joints, like those in the feet, can be affected. When it occurs only in the joint, it is known as septic arthritis. When an infection elsewhere in the body triggers joint pain, it’s called reactive arthritis. Gout can also play a role in cases of OA, RA, and psoriatic arthritis. It’s the result of uric acid crystals being deposited in the joint, and it causes severe pain and swelling in the big toe. Some risk factors for gout include alcohol and shellfish consumption. Exercising and stretching your feet and toes will help with joint mobility and flexibility. Opt for simple stretches that will relieve tension in the tendons in your toes and the balls of your feet. Start off with a simple exercise (i.e. wiggling your toes). Low-impact exercises like swimming or water aerobics are better than walking or running because they don’t add extra stress to already sensitive joints. Comfortable and supportive shoes are essential. Your shoes should be wide enough so they don’t press on bunions or corns. Women with arthritic feet and toes should avoid wearing high heels—it will only put unnecessary pressure on the feet. Athletic shoes have stronger soles and should put less strain on your feet as you walk. Apply a topical ointment to arthritic toes for relief. Effective topical ointments contain capsaicin. Capsaicin is an ingredient found in chili peppers that is believed to decrease substance P—a peptide that transmits pain in the body. You can purchase capsaicin in various forms, such as a stick, gel, ointment, or cream. Knead the balls of your feet and your toes. Begin at the top and work your way down to the base. Gently massage each toe. You don’t have to spend a lot of money on a professional masseuse—perform this massage on your own or have a friend do it. Shoe inserts, canes, or braces can help provide relief for arthritic toes, depending on the severity of the arthritis. Shoe inserts, in particular, are beneficial because they help correct misalignments and distribute your weight evenly when you walk. Hot and cold treatments can help during flare-ups, but how you use them depends on your needs. A hot compress is used to relax muscles and lubricate joints to relive stiffness, while a cold compress is to reduce swelling and inflammation. Using heat before activity is worthwhile, and cold therapy should be applied afterwards if pain and inflammation occurs. Acupuncture is an ancient Chinese practice that may help relieve the symptoms of arthritis. It involves inserting small needles into various areas of the body to restore balance and reroute energy. It may have the ability to reduce arthritis pain. Lose weight: Any added stress on your feet can make toe arthritis symptoms worse. If you’re overweight, try making some lifestyle changes—like eating healthier and getting more activity—to help you lose some of the extra weight. It can also help improve circulation to the area. Add healthy fats to your diet: Fatty acids, particularly omega-3s, can help reduce inflammation and may help limit the symptoms of arthritis. Some studies have also shown that these acids—DHA and EPA—may suppress the immune system to limit arthritic flare-ups. Salmon and other fatty fish are the best sources and supplements are widely available. Try some turmeric: Turmeric is a plant native to India and Indonesia and is a common ingredient in curries. Curcumin—a notably active compound in turmeric—may be able to reduce pain, inflammation, and stiffness related to RA, OA, and bursitis. You can supplement or try adding more turmeric to your diet. Keeping the toe joint limber and lubricated could be a good defense against pain in the MTP joint. Extension exercises can help improve range of motion in the toe—how far you can move it—while potentially reducing pain. Start with the toe in its regular position and then bend it up and down with your hands, holding each bend for 30 seconds. Flexibility exercises are also helpful, and can be performed by crossing the affected foot over your knee. Gently grab the foot behind the toe joint using your opposite hand. Making sure the foot is held stationary the entire time, use your hand to gently pull the toe away from the foot. Hold the position and gently rotate the toe in a clockwise or counterclockwise direction. Dorsiflexion exercises are also recommended and can help with pain and mobility. Cross your affected foot over the opposite knee and bend your toe backwards as far as possible with your hand. Making sure there is no pain, hold for about 20 to 30 seconds and then relax. Risk factors for toe arthritis include being overweight, age, family history, and even wearing high-heeled shoes! Genes: The anatomy of your foot is dependent on genetics, and if you’ve got flat feet or excessive pronation (feet that turn in), you are at a higher risk for OA. The risk is heightened by the additional weight and pressure put on the big toe. Previous toe injuries: If your toe has been broken or sprained in the past, there is a greater risk for toe arthritis because the cartilage in the joint may be damaged. Age: Age is a risk factor for arthritis, and most cases are diagnosed after age 30. Work: If your job requires a lot of squatting or stress on the toe joint, it could increase the risk. Other health problems: Other inflammatory conditions like RA, gout, or lupus can play a role. While some factors behind toe arthritis cannot be controlled, there are a few steps you can take to reduce your chances of getting the painful condition. Treat any injuries: Injuries play a role in toe arthritis, so be sure to get proper treatment if needed. You can protect yourself from injury by wearing shoes with toe protection when needed, picking things up off your floor, and walking with care. Keep your weight under control: Removing excess stress on the feet from body weight can help. Every one pound of scale weight adds about four pounds of stress to the knees, which impacts the joints in your feet. Manage your blood sugar levels: People with type 2 diabetes are twice as likely to have arthritis as those who don’t. People with high blood sugar develop molecules that lead to stiff cartilage, while diabetics are also more prone to inflammation. Stay active: Regular exercise helps strengthen muscles and relieve stress from joints. It also promotes circulation and helps keep joints limber, so shoot for at least 30 minutes of exercise per day. Your toes contain joints that, like any others in your body, are not immune from arthritis. A variety of factors play a role in your risk for toe arthritis, but there are lifestyle and dietary adjustments you can make to reduce the chances you’ll get it. If you’ve been having pain in your toe joint, speak to your doctor about potential causes and treatments. “Riskowski, J., “Arthritis, Foot Pain & Shoe Wear: Current Musculoskeletal Research on Feet,” Current Opinion in Rheumatology, 2011; 23(2): 148-155. Ways to Prevent Foot Pain and Get Around,” Arthritis Foundation web site; http://www.arthritis.org/about-arthritis/where-it-hurts/foot-heel-and-toe-pain/foot-heel-and-toe-care/prevent-foot-pain.php, last accessed October 8, 2015. “Toe Arthritis,” ToeHurts.com, http://toehurts.com/arthritis/, last accessed October 8, 2015. “Stress and Arthritis,” University of Washington Department of Orthopaedics and Sports Medicine web site; http://www.orthop.washington.edu/?q=patient-care/articles/arthritis/stress-and-arthritis.html, last accessed October 8, 2015. Macon, B. and Reed-Guyon, L., “Arthritis,” AARP Health Tools, August 14, 2017; http://healthtools.aarp.org/health/arthritis, last accessed March 26, 2018. Story, C., “My Aching Feet: Symptoms of Arthritis in Toes,” Healthline, Medically reviewed by William Morrison, MD, on August 2, 2016; https://www.healthline.com/health/arthritis-toes#1, last accessed March 26, 2018. Seymour, T., “Arthritis in toes: How is it treated?” Medical News Today, Last reviewed by Nancy Carteron, MD, FACR, on October 21, 2017; https://www.medicalnewstoday.com/articles/319769.php, last accessed March 26, 2018. “About Psoriatic Arthritis,” The National Psoriasis Foundation; https://www.psoriasis.org/about-psoriatic-arthritis, last accessed March 26, 2018. “Top 3 Types of Arthritis,” WebMD, Reviewed by Nayana Ambardekar, MD, on November 21, 2017; https://www.webmd.com/rheumatoid-arthritis/guide/most-common-arthritis-types#1, last accessed March 26, 2018. “Infectious Arthritis,” The Arthritis Foundation; https://www.arthritis.org/about-arthritis/types/infectious-arthritis/, last accessed March 26, 2018. “Physiotherapy for Hallux Rigidus,” Happy Physio; https://happyphysio.com.au/physiotherapy-for-hallux-rigidus/, last accessed March 26, 2018.